Chilean President Sebastian Pinera -- speaking on October 13 after the miners' release -- is due to arrive in the UK on Saturday. 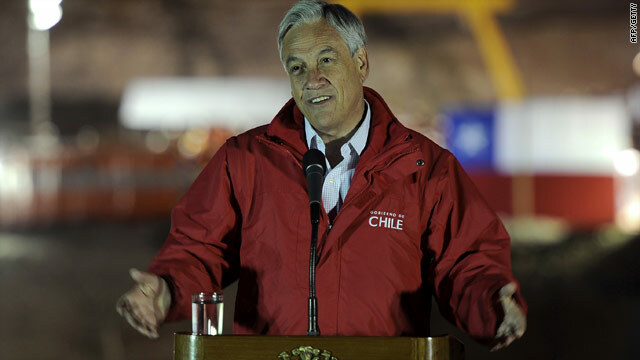 London, England (CNN) -- Sporting a burnished image after the rescue of 33 trapped miners, Chilean President Sebastian Pinera is arriving in England on Saturday. He is scheduled to meet with British Prime Minister David Cameron on Monday. Cameron spoke with Pinera earlier in the week after all 33 miners were successfully hoisted to safety, a spokesman for the prime minister said. He told Pinera that the rescue effort had demonstrated tremendous skill. Pinera had vowed to be at the San Jose mine in northern Chile until all of the miners were out. True to his word, he greeted each miner with a hug as they stepped out from the rescue capsules to fresh air for the first time. Pinera called the rescue a "magical day" for Chile, one that fueled patriotic fervor as the entire world cast its eyes on the South American nation.